No buns? No problem! 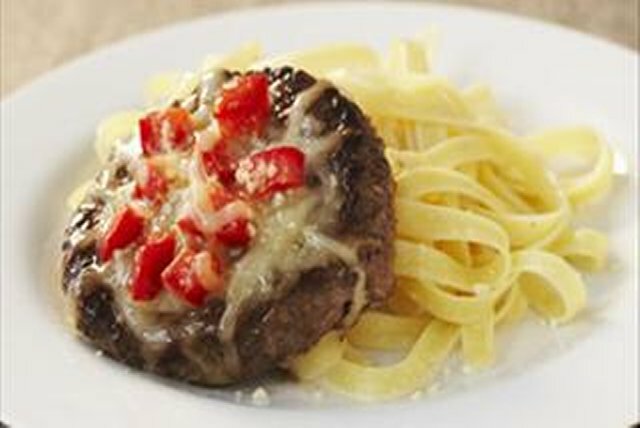 These tomato- and Parmesan-topped beef patties taste delicious served on a bed of hot cooked pasta. Preheat broiler. Place patties in single layer on broiler pan. Broil 5 min. Turn patties over; top with remaining ingredients except pasta. Broil an additional 3 to 5 min. or until burgers are cooked through (160ºF) and shredded cheese is melted. Serve with pasta. This recipe is equally delicious when prepared with ground chicken patties!